John Lithgow was right: Rock and Roll is a corruptive influence! Stop that dancing right this instant, young Kevin Bacon! 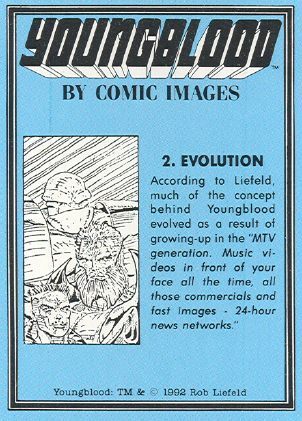 Yes and all those biceps and bulging buttocks swinging in the camera undoubtedly had a resonating influence over the young Liefeld mind. Wait, wait, wait. Are you saying that there was actually a concept behind Youngblood? I always assumed he just published the doodles from his ninth grade biology notebooks.